Chicago, USA - November 01, 2017 - Boeing (NYSE: BA) announced its investment in Valencia, Calif.-based Gamma Alloys, a leader in aluminum alloys focused on developing advanced metal-matrix composites for use in aerospace, automotive and other industries. This investment by Boeing HorizonX Ventures, which was established earlier this year, is its first in advanced materials and machining development and applications. Mark Sommer, CEO of Gamma Alloys, presenting a pitch at the 2017 Paris Airshow. 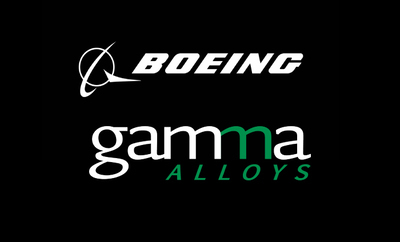 Boeing (NYSE: BA) announced its investment in Valencia, Calif.-based Gamma Alloys, a leader in aluminum alloys focused on developing advanced metal-matrix composites for use in aerospace, automotive and other industries. This investment by Boeing HorizonX Ventures, which was established earlier this year, is its first in advanced materials and machining development and applications. Gamma Alloys’ Director of Nanotechnology Research, Dr. Marco Curreli, presented a pitch at the 16th Annual NanoBusiness Commercialization Association Conference (NanoBCA), which was hosted at the law firm G&L Gates in Washington, DC. "The wear, strength, durability and machining characteristics of Gamma's materials have the opportunity to further reduce the weight of our products," said Steve Nordlund, vice president of Boeing HorizonX. 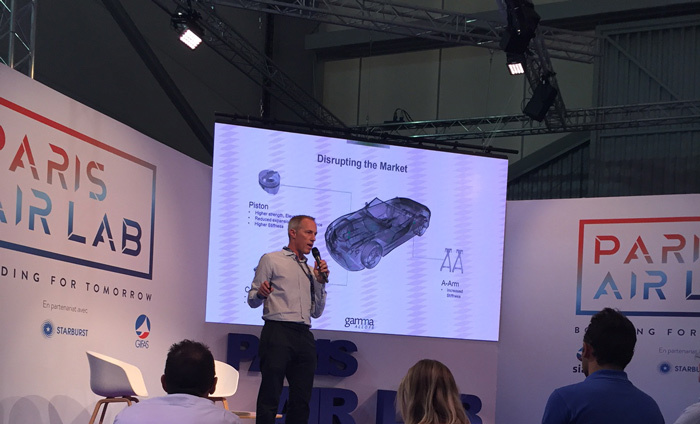 "The traction that Gamma Alloys has gained in automotive, energy and aerospace reinforces our confidence that Gamma has a unique set of materials." Gamma Alloys, founded in 2008, is pursuing breakthroughs in nano-reinforced aluminum alloys, where the aluminum is reinforced with microscopic particles, or nanoparticles. These alloys provide increased stiffness, improved wear resistance, and greater strength than current materials across a wider range of temperatures. Gamma Alloys has patented manufacturing procedures, utilizing nanotechnology, to reinforce aluminum alloys. We achieve properties previously unreachable and enable applications so far unimagined. We create metal-matrix-composites reinforced with artificial precipitates. The result is materials with increased stiffness, improved wear resistance, and superior strength, at both room and elevated temperatures. Gamma Alloys is particularly focused on custom solutions where design engineers are currently limited in what they can create with traditionally available materials. "With funding from Boeing, we will explore compelling applications across demanding industries such as aerospace while accelerating our nanoparticle material development and the full-scale industrialization of our manufacturing processes," said Gamma Alloys CEO Mark Sommer. "The decision to choose Boeing HorizonX Ventures was simple – the opportunity to partner with Boeing was too compelling to pass up." By leveraging the power of the world's largest aerospace company, Boeing HorizonX invests in new business ventures to unlock the next generation of game-changing ideas, products, and markets. The Boeing HorizonX Ventures portfolio includes investments in autonomous systems technology, wearable enabled technologies, augmented reality systems, hybrid-electric propulsion and artificial intelligence. HorizonX also seeks unique business opportunities and non-traditional partnerships for the company's aerospace technology using disruptive innovations and business strategies. Chicago-based Boeing is the world's largest aerospace company and leading manufacturer of commercial jetliners and defense, space and security systems. A top U.S. exporter, the company supports airlines and U.S. and allied government customers in 150 countries.